By thoroughly testing Web Object Wizard (WOW), we are confident your developers will find it easy to use. However, determining your business ROI by purchase of software can be a daunting task. So, we would also like to explain the cost savings that you can expect by incorporating WOW into your organization. This guide will show the benefit you will obtain with the purchase of WOW. Why WOW? If you are reading this document, you either have a very serious interest or need to develop some internal or external Web-based applications to service employees, customers, vendors, or managers. With the use of Intra and Internet becoming increasingly popular among business staff and customers, there is no doubt that creating Web-based data centric applications will save most companies money. With all the options available to create these applications, it is no wonder the evaluation process is often times frustrating. The primary purpose development with WOW is to remove much of the redundancy in developing Web applications. Companies developing in Java are often faced with a lengthy training and development period. However, WOW provides existing development staff (technical and non-technical) the ability to develop Web applications in minutes, right out of the box. Companies using WOW for Web development often save 100-400 times the time invested in service hours. Take these saved hours and multiply them by the number of applications you're developing and clearly the WOW product will pay for itself in a very short time. Many RPG shops developing with WOW create dynamic, robust applications in minutes with no training at all. Java developers using WOW create highly customized, extended applications also in a very short time. PlanetJ staff does provide two, 16-hour training courses, which are highly recommended. These allow student access to a WOW specialist to assist with the initial installation and application(s). WOW Intro and WOW Advanced classes are provided either onsite or online. Full course descriptions can be obtained on PlanetJ's website. It may also be necessary to train staff in writing SQL statements which can take 1-2 days for basic capabilities and about 2 weeks for high productivity. You can trust PlanetJ to provide the highest quality education available today. Whether onsite or online, these classes will expedite development and build comfort in using WOW. WOW has all the necessary features to produce complex, powerful applications built right into the product – no programming knowledge necessary. It allows programmers of all skill-levels (including no skills) to avoid redundancies in coding tasks such as updates, inserts, deletes, automatic conversion to MS EXCEL or XML, validation, OS level security, and much more. There are over 270 features of WOW that shorten development time significantly. Also, companies wishing to integrate specific logic into applications can easily manipulate the WOW framework by adjusting the WOW API using industry standard JAVA (no proprietary language). Web applications are created by specifying SQL/JDBC statements after which WOW generates and displays the results in HTML to the user's browser. WOW makes Web development simple, fast, and flexible for any user. Standard inquiry and maintenance applications can be built from start to finish in a few minutes. • Export all data to Excel, XML, PDF, Word, etc. • And many, many more…over 270 features. WOW allows the user to configure validation rules via metadata. Fields can be marked as required and also assigned a business object such as Social Security Number. Upon an insert or update, validation is performed based on these settings. Controlling user access to applications often involves complex rules specific to each business. This may include integration with existing security schemes and databases. Or, it may involve tracking application usage for security or billing reasons. Whatever the situation, if it is not already handled by WOW's basic operations, WOW can easily be extended to provide the needed behavior. WOW allows Web applications to be secured in a variety of ways including operating system authentication, local users only, or database driven authentication. Also provided is the ability to secure operations and even fields for particular users. The WOW self-service feature allows row level security (e.g. suppliers can only see their records). All security is defined and enforced through metadata. WOW allows users to easily create any type of "data centric" Internet/intranet/extranet application significantly faster than alternatives without manual coding and configuring Java, JSPs, and WebSphere. WOW can be used to access data stored in any relational database - DB2, UDB, Oracle, SQL Server, etc. In addition, WOW provides built in connection pooling and multilevel caching enabling ultra fast performance that is customizable. These are set on the WOW operation within the application. Updates are automatically tracked and cache is automatically reset. A full array of JDBC optimization parameters is available to optimize the data access as well. The WOW framework also handles DB persistence and session management. For advanced validation and features, WOW supports extensions using Java inheritance. WOW business objects can be subclasses, thus behaviors and rules can be added using 100% industry standard Java. This advanced programming is typically done in a Java IDE such as Eclipse or WebSphere Studio. All screens produced by WOW can be replaced with customized versions specific to a user or company. This can be done by creating custom JSP's and then instructing WOW to use the custom JSP for various operations. These customized JSP's can provide UI behavior that enhances the base functionality of the WOW Builder. NOTE: Color, font, images, etc are easily customized using just straight CSS. Once WOW is installed, no further deployment is necessary. The WOW framework executes applications using high speed, dynamic cache. All metadata is retrieved and executed by the framework. New applications do not require a deployment to the server. WOW typically executes a web application on WebSphere or Tomcat application servers. Since WOW is 100% Java, it can run on any Java enabled platform such as iSeries, Windows, Linux, and Unix. 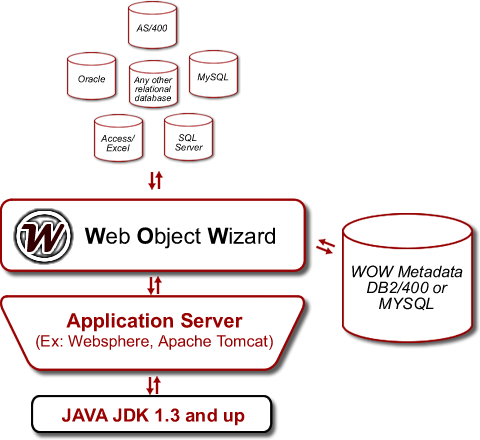 JDBC allows WOW to access all databases including DB2, Oracle, SQL SERVER, and MYSQL. Over the years, PlanetJ has received requests to run WOW on a wide variety of system structures. Many organizations also have very functional green screen applications and want to utilize existing legacy code in browser fashion. This is easily accomplished with WOW. WOW allows this cross-functional capability due to its innovative framework. These separate functions can use WOW's common Java technology to pass their data in user-friendly browser-based format. WOW can run on ANY platform and against ANY database. This makes the integration of WOW into an existing environment very simple and flexible. Customers can choose any type of hardware and operating system (iSeries, HP-UX, Linux and Windows or almost any other system) and develop and run their web applications. • WOW can access all major databases leveraging strategic JDBC and SQL technology (DB2, MySQL, SEQUEL, Oracle, iSeries, etc.). WOW can run on any platform with a Java Web Server like Apache Tomcat, WebSphere, or Windows. • Migration to other platforms is seamless. • WOW is written in and uses industry standard 100% Java for customization. Customization is fully extendable using the WOW API. • WOW has been called the "Ultimate Java Tool" for RPG programmers in iSeries Network Magazine, Oct 2004. • WOW won the Gold award for application development tools from Search/400 editors in 2004 and 2005. • WOW won the Silver award for application development tools from Search/400 editors in 2003. • WOW is a strategic member of IBM's Roadmap for Java. • WOW is used by thousands of customers across many industries. PlanetJ is a company that has built its reputation on customer and product support. Our team wants to help you, our colleagues, develop your Web applications in the most efficient, cost effective, and rapid way so that you may help your customers, employees, and vendors. By using WOW in your environment, you will have easy access to a professional team that knows Web development. You will be provided a single point-of-contact for support as well as back-up staff should your contact be temporarily unavailable. PlanetJ service hours are available for building and/or customizing your WOW applications. These services can be contracted through PlanetJ business coordinators. Easily access them via email at info@planetjavainc.com. If your team does not have the time, PlanetJ can create your applications for you – using WOW faster than any other organization out there which will further increase your ROI. Development Staff: Most of the PlanetJ developers and WOW specialists are former IBM employees, working from the Rochester, MN plant. They have extensive experience in writing rapid Web applications. They further specialize in WebSphere and Java education and consulting service. Business Staff: The business office at PlanetJ is staffed by helpful individuals that will streamline the process of obtaining WOW software, organizing your team's education and handling service contracts. They have a combined experience of 20+ years in business support and services.